I love giving handmade gifts, especially ornaments! Now is the time to start creating unique and meaningful handmade gifts! Are you following my Holiday Bake Craft & Crochet Series? Yes, we have added crochet tutorials too! By the end of the month Thirty Handmade Days, Your Homebased Mom and I will have shared over 100 fabulous handmade gift tutorials. Each day be sure to visit the guest poster’s blog for a chance to win BIG! Up for grabs is a Cricut cutting machine, a Blendtec blender, a Baby Lock sewing machine and a $300 Michaels gift card! Grab a new entry every day! Visit Indygo Junction today to enter to win the Baby Lock Sewing Machine. Hello, I’m Amy and I am so thrilled to be part of the Handmade Holiday! 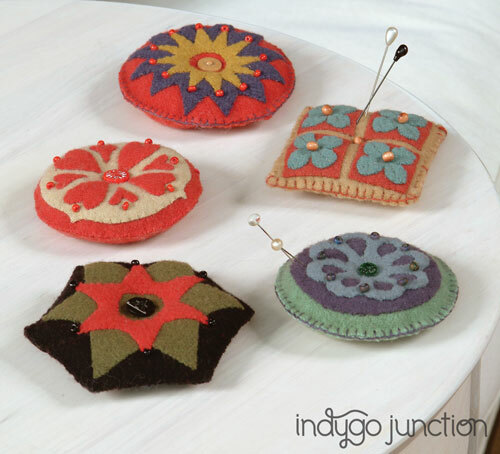 As the owner of a pattern company, Indygo Junction, I think handmade gifts are the best. 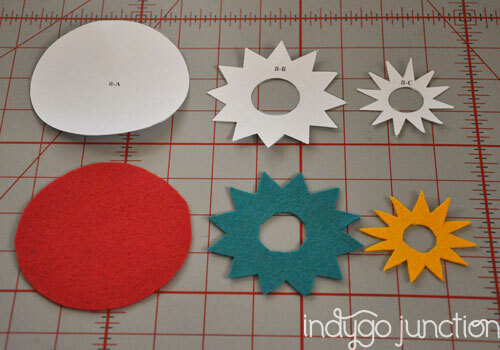 Today I want to share with you a pattern for making an ornament out of felt, which I originally published in Indygo Junction’s book Merry & Bright. 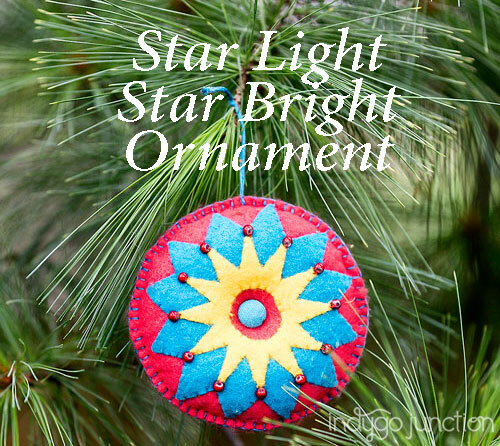 I chose this tutorial thinking of my friend who gathers her family on Thanksgiving to make ornaments. This has been part of her holiday tradition for years and her family loves creating a new ornament every year – they have built quite a collection! Maybe this year you start a new tradition with your own family – this project has simple stitching for the novice, or a more seasoned stitcher could embellish this with their own creative twist. Enjoy! 1. Click here to download the pattern pieces in pdf form to print. Make templates 8-A, 8-B, and 8-C by tracing designs to paper or plastic template material. 2. Cut two 8-A’s from red felt, cut one 8-B from blue felt and cut one 8-C from yellow felt. 3. Center 8-B on the right side of 8-A, pin. 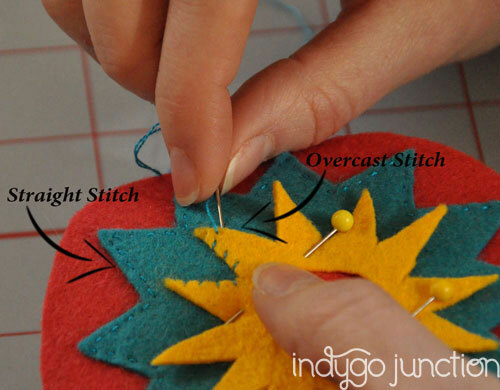 Using one strand of your teal embroidery floss, applique using either a straight stitch, or an overcast stitch, around the outer triangles of the felt, as well as the inner circle. 4. Center 8-C onto 8-B, pin. 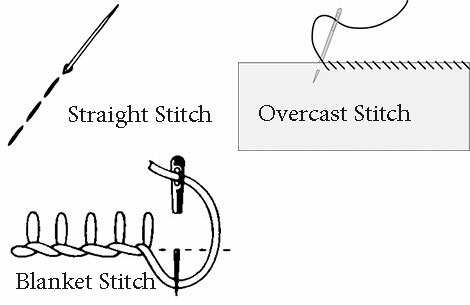 Using one strand of your gold embroidery floss, applique using either the straight or an overcast stitch from the star points to the edge of the inner circle. 5. Stitch red beads to points of yellow wool star. 6. Pin front to back wrong sides together. 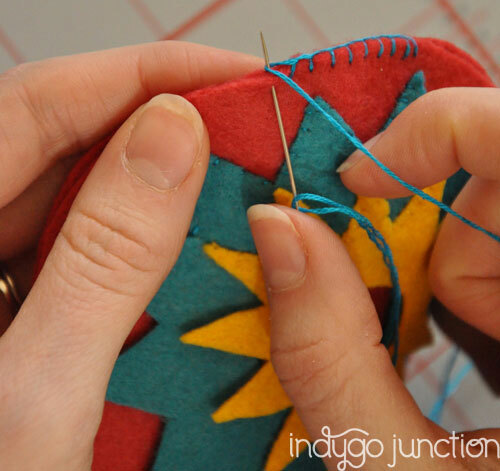 Using two strands of the teal embroidery floss, blanket stitch around the edges, leaving a small opening for stuffing. Stuff and blanket stitch the opening closed. 7. Sew button to center, pulling tight to indent the ornament. 8. Use 6 strands of embroidery floss to make a hangar loop and stitch to edge of ornament. Merry & Bright includes not only this pattern, but 8 other ornaments to create out of felt and embellish with beading and embroidery. The designs would also be perfect for pincushions! The book also includes instructions for tree garland and a holiday table mat. Amy Barickman has been inspired to create for as long as she can remember. In high school Amy started her first business making teddy bears. 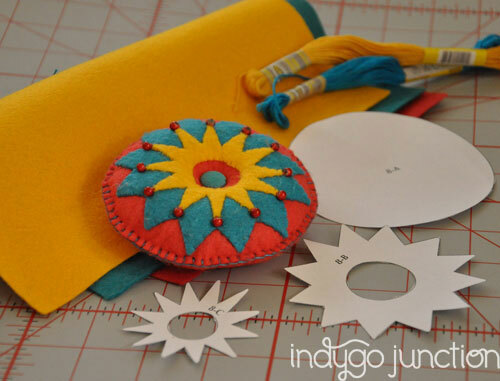 After graduating from The University Of Kansas, she launched Indygo Junction, a sewing pattern and book company where she teams up with innovative artists and has published over 1000 pattern titles and written over 80 books. Amy also designs quilting cotton lines as well as her Crossroads Denim line. “Vintage Made Modern” is Amy’s mantra. For years she collected vintage textiles and fashion sewing books, finding them to be a treasure trove of inspiration. She found her muse, Mary Brooks Picken, whose work in the early 1900s with The Woman’s Institute, drove Amy to write Vintage Notions: An Inspirational Guide to Needlework, Cooking, Sewing, Fashion & Fun and her new release, The Magic Pattern Book. Now Amy shares a curated selection of her vintage fashion, sewing and design collection on her site AmyBarickman.com. Stop by for a visit! that is SOOO pretty!! I love felt and this ornament is just perfect! Pinned it!